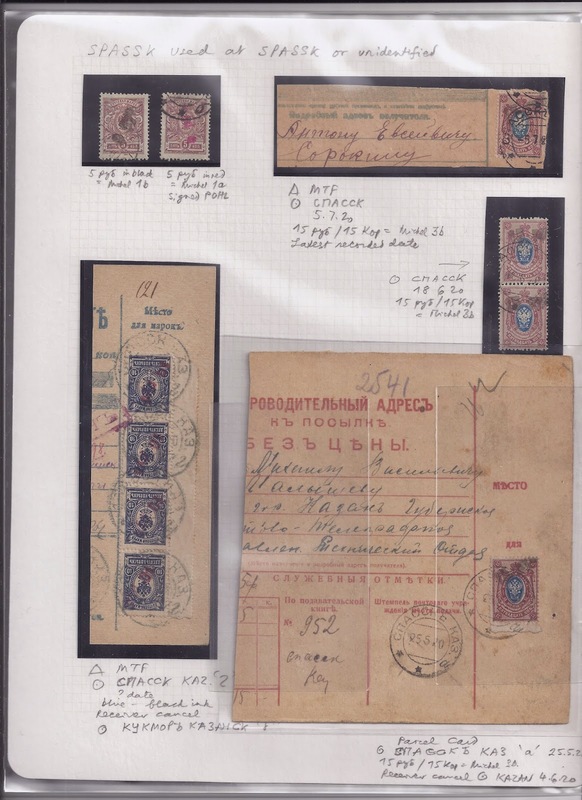 In Spring 1920, the Soviet People's Commissariat for Posts and Telegraphs (Sovnarkompochtel) told the post offices under its control to revalue all their kopeck stamps denominated between 1 and 20 kopecks into equivalent rouble stamps: in other words, a one hundred times revaluation. This was a cheap and efficient way of conserving stamps at a time of inflation by making better use of low value stamps - in fact, 100 times better use! 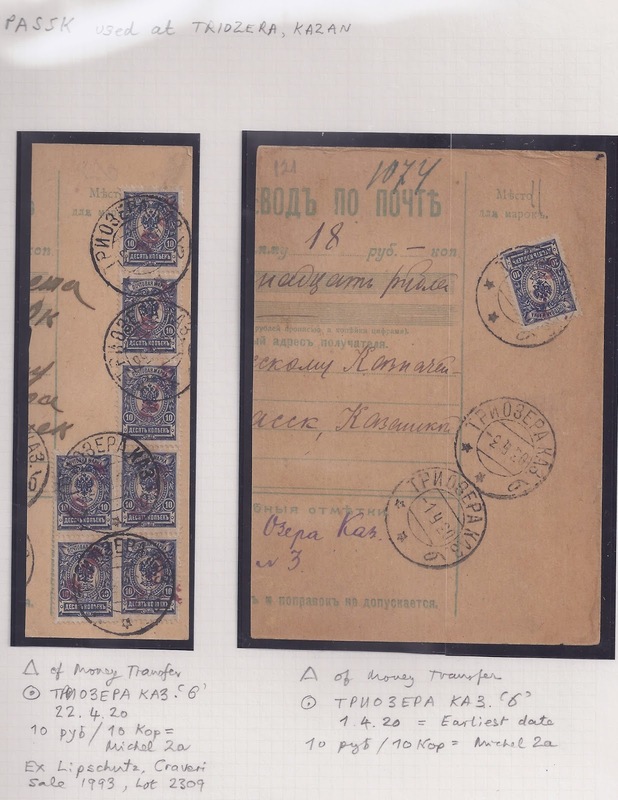 Most post offices revalued their stamps "silently" - there is nothing to show the stamps are now rouble stamps. A few post offices produced cachets to apply to Money Transfer forms and Parcel Cards indicating that the stamps had been revalued. Some post offices overprinted their kopeck stamps with something - either a "p" or a "pyb" - to indicate that these were now rouble value stamps. 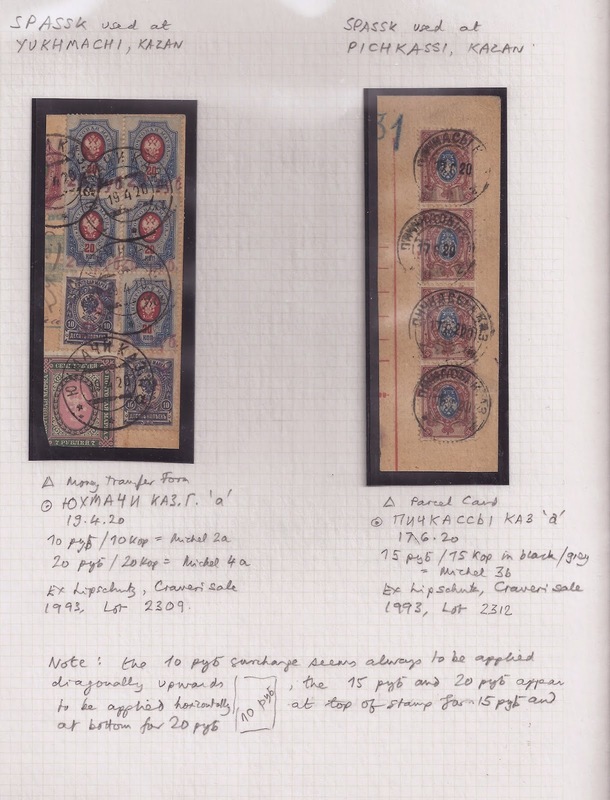 All of this was done without any philatelic inspiration or manipulation, which is a main reason why for most surcharged revaluations mint copies are unknown or virtually unknown - a fact which forgers have generally ignored. 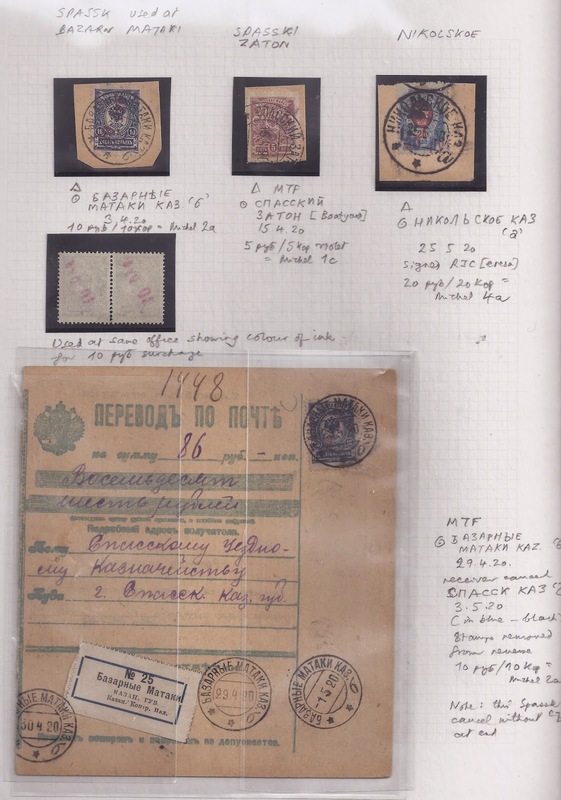 Only in a few cases were mint remainder stocks returned at a later date to Moscow and passed to the Soviet Philatelic Association. 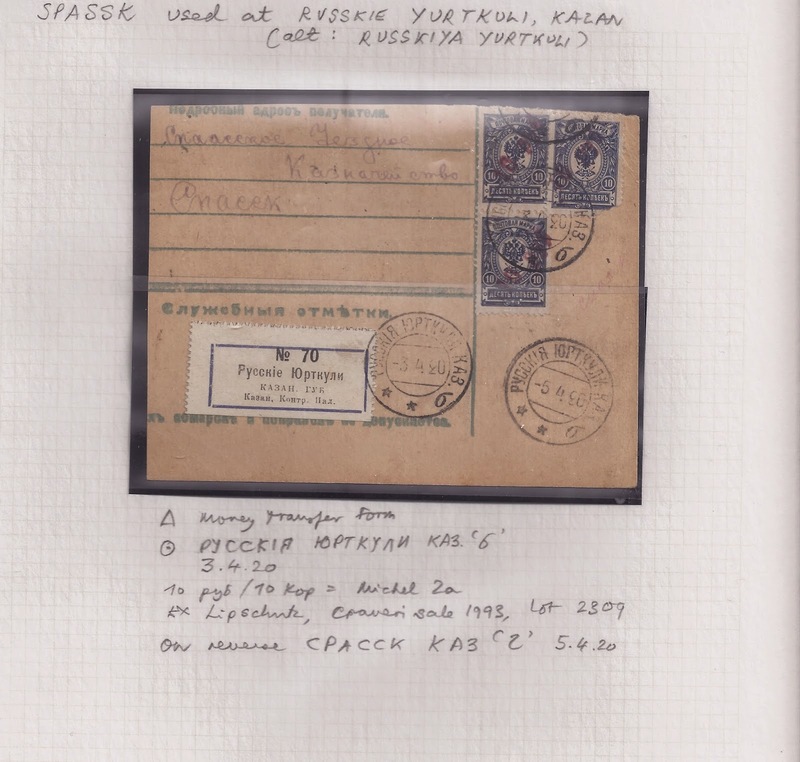 What was passed to the SPhA in massive quantities were bundles of used Money Transfer Forms and Parcel Cards on which most of the revalued stamps had been used. Of course, maybe ninety nine percent of formulars in the bundles had no Postmaster Provisional overprints, so that a very large job of sorting out had to be done.But despite the labour-intensive work, it was from these bundles from the archives that the SPhA made early catalogue listings of which post offices had produced what surcharges.Very few Postmaster Provisionals were used on letters or postcards since in 1920 these could be sent free, unless Registered or overweight. Many Postmaster Provisional overprints appear to have been used by a single post office but some were distributed from a main office to local or dependent offices. This was true in the case of Spassk in Kazan guberniya, where maybe a dozen offices made use of the stamps produced in the Spassk office. The images below show my holding for these Provisionals - and the images probably indicate that collecting such things is not for the faint-hearted or for those with a desire for the beautiful. As usual, Click on the Images to magnify them.